CloudWay is very proud to announce that we have two speakers at Evolve Conference September 10th in the UK. 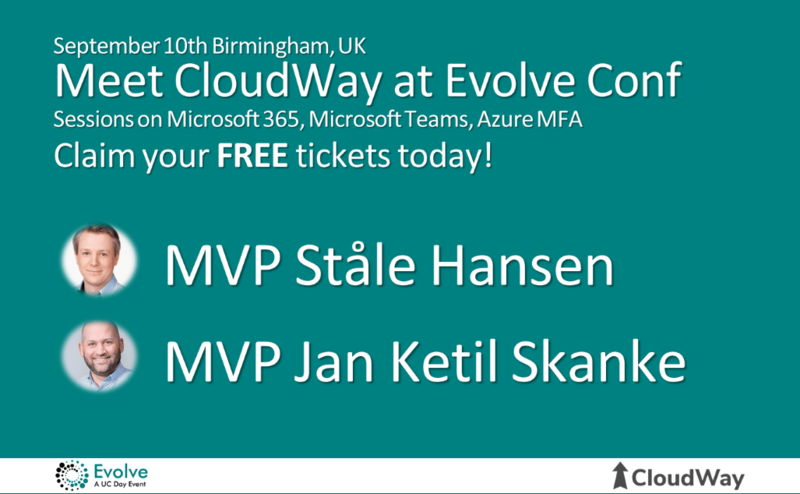 MVPs Ståle Hansen Jan Ketil Skanke will share their knowledge on Microsoft 365 explained, Microsoft Teams Cloud Voice and doing Azure MFA right. Having two speakers in the same international conference shows that CloudWay focuses on the right technologies and have the people wants to share their deep understanding. Evolve Conference is a completely free event, make sure you book your tickets today! Wondering what Microsoft 365 really is? You will leave this session understanding the different SKU’s and why you should focus on Enterprise even for small companies. You will learn how to sell it internally in your organization, pitch it to customers or understand the technical requirements as a consultant. MVP Ståle Hansen will share from his experience as Office 365 sales coach and as an architect with deep knowledge on how the components fit together. This session is a great place to get started with Microsoft 365. Most organizations have understood the need for securing cloud identities with a second factor of authentication like Azure MFA. Still, a lot are doing it wrong. It is not complicated to do Azure MFA the right way by using Intune and Conditional Access together. Come to this session and learn how to protect all cloud apps and identities in a way that doesn’t break the user experiences. Join tech professionals from the UK and beyond for this year’s Evolve Conference – the free conference for IT pros focused on Microsoft 365 and Azure. Our conference is completely FREE to attend – supported by sponsorship from some of the top companies in Office 365 tech. You’ll join around 500 other IT pros from all backgrounds, and we’ll even provide refreshments and food for you during the day. Evolve Conference returns to Birmingham’s National Conference Center (at the Motorcycle Museum, near the NEC and Birmingham International Airport/Rail Station) and the doors open from 8AM – or if you are travelling from afar, join us the evening before just up the road at the Windmill Hotel, Coventry for a pre-evening event. After you register, we’ll send full details.